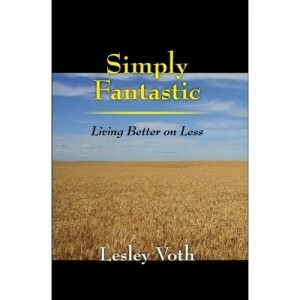 “Simply Fantastic: Living Better on Less“ by Lesley Voth is a book about grabbing your personal finances by the horns and living your life to the fullest with more control, freedom, and options that present themselves when you have your finances under control. Voth provides 518 tips and strategies in her book to help you save money, reduce your cost of living, and enable you to better manage your personal finances. She writes in a very easy to understand, fun manner with anecdotes that can help most people who may be struggling with money problems or those who are new to managing their own finances. What I Liked About This Book. The sheer amount of tips in this book is incredible. There are 518 money saving and personal finance tips in this book to be exact. The book is a quick read and often each tip is often its own paragraph. And, the interesting stories included make this book an easy read. One of my favorite stories that the author tells is when she ran out of gas on her way home from work one day as a teenager. It was several days until the next payday, she had not set a budget for her money very well, and she asked her father for a loan. After he said no to teach her a lesson in spending her month wisely, she had to walk back and forth to work every day and pass her very own car that was sitting on the side of the road. This is just one of the interesting and fun stories that comprise the book. Through these antidotes, Voth manages to instill some wisdom with respect to use of money. The Money Saving Tips. Like I said early, there are 518 different money saving and money management tips in “Simply Fantastic: Living Better on Less“. In the beginning of the book, Voth recommends circling the tips (most are numbered) and implementing them as soon as possible. I thought that it would be fun to share a few tips with you from the book. I won’t give away too many. You will just have to read out the book to see the other 508. Track your spending for a month with a small notebook. Write down every purchase you made down to the very penny to see where your money goes every month. Be the best [employee] you can be. Right now in this economy be thankful for the job you have. You may not like what you are doing, but do your best. I wrote about this very same topic when I said that a recession is not the time to shirk at your job. Make a plan for your meals for the week. Go to the grocery store with a list and do not stray from it. Turn off the tap when you are brushing your teeth or shaving. You may be wasting up to three gallons per day. Prewashing dishes is a waste of energy and water for most new dishwashers that are powerful enough to clean the dirtiest dishes. 18% – 30% of your electric bill goes to heating your water. Make sure that you take care of your hot water heater with a hot water heater blanket, turning off the heater while you are on an extended vacation, and drain a quart of the water every three to six months to remove sediment. Use motion sensors on lights in your house to ensure that your lights are off and not left on. My work just did this, and it is very efficient. Do not go to a car dealership for repairs if your car is not under warranty. Local automotive shops will do just as good a job for a fraction of the cost of a dealership. Slow down while driving….slowing down by just 3mph can save fuel. AAA estimates that driving 62mph instead of 75mph can increase fuel efficiency by as much as 15%. Create a home maintenance and repair fund so your emergency fund will not be crippled by unexpected things that break in your house or apartment. What I Did Not Like. “Simply Fantastic: Living Better on Less” focuses a lot on frugality which is a topic that I do not cover very much here on the blog. There are some great suggestions in the book, but there are a few suggestions that may seem a little old fashion to younger readers. There are also a few points that the book makes that I personally would not advocate. Unlike the author, I am not a fan of multi-level marketing companies like AmWay. That’s just one example. Who Would Benefit From This Book? This book is written for anyone whose life may seem out of control financially. “Simply Fantastic: Living Better on Less“ would be a great read for someone just starting out after college or on their own for the first time, young couples, someone looking to fix mistakes that they have made in the past with respect to their money, or someone looking to start over after being clobbered by the market and the recent recession. Our lives are meant to be simply fantastic, and that is the goal of this book. Lesley Voth wants everyone to be able to live the life that we all hope and dream of. This book was written in the hopes of helping you take control of your money, you life, and living simply fantastic.